There’s a lot of A’s in that title, eh? The first issue wasn’t quite what I expected, but then I don’t know what I was expecting if I’m being honest because despite my love of all things Valiant, I’ve really had no exposure to Archer or Armstrong before aside from a few pages here and there. With this being the first full comic featuring the two of them I’ve ever read, I decided to read the preview text that Valiant had sent over (you can find the full preview here, including the images I didn’t bother to look at), which you can find below, before delving into the comic. Now if you read the above link you’ll notice there’s an extra paragraph that I didn’t include because I didn’t read it before I read the comic, and since I wanted us all to start with more or less the same idea as to just who these characters are I left it out of the above quotation. Well, now that we’re three hundred odd words in, you’re probably wondering if you should bother reading the rest of the review, eh? If I’m about to lose you because I’ve rambled too much, then go buy A&A: The Advetures Of Archer And Armstrong #1. The release date is March 16th, so make a point to treat yourself. That’s the nutshell review. You probably want a bit more information regarding why I think you should spend your hard earned cash, eh? Not a problem. 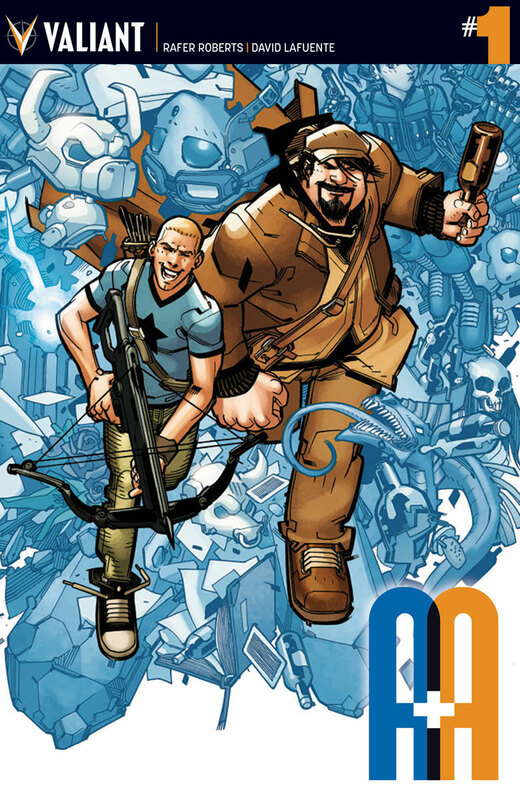 A&A: The Adventures Of Archer And Armstrong #1 has something that’s missing all too often in the less-than-optimistic world of modern comic books: a sense of fun. Despite the potential rocky ground that could come from handling a character who has a reputation as an immortal alcoholic, Rafer Roberts writes an underlying sense of sadness and despair about Armstrong that hints that maybe not everything is as rosy as it seems with the immortal, but despite that, this is an incredibly fun comic. The issue is chock full of subtle (and not so subtle) contrasts; not only the difference between the two leads, but Archer himself with his more sheltered outlook on life and his martial proficiency (the guy won’t even curse! It’s actually kind of amusing to see Roberts use some pretty interesting language – it also makes me realize just how accustomed I have become to cursing). The art here is also very solid, which is honestly something that doesn’t surprise me given the talent that’s responsible for the comic. A&A: The Adventures Of Archer And Armstrong #1 is a very good comic that’s absolutely New Reader friendly (and I’m saying that from the perspective of a new reader to these characters). I may not be as familiar with Archer or Armstrong as I am with the immortal’s brothers, Ivar (Time Walker) and the Eternal Warrior, but if the rest of the series is as good as this issue then I’m along for the ride all the way.